The score box lets you post all the information necessary for a score...course, tee, date, adjusted score, and score type. Type the first letter of the course until it appears and press Enter. Drop the list box and select the course. The Alt + Down Arrow keys also open the list box. Note: If the course the score was played on is not in your course library, you may either enter it as an (Rating\Slope) away course (see below) or exit the score box and click the Courses button to enter the new course in your course library. Courses should be placed in the library if they will be used on a regular basis. If the course is not a regular course and you don't want it to be in your course library, select the course named (Rating\Slope) Away course and press Enter. Type the correct rating and press Enter. Type the correct slope and press Enter. Note: The last course you select becomes the default course for the next score you add. The tee box works just like the course box. Type the first letter of the tee to select it and press Enter, or click the down arrow to open up the list box and select the correct tee. Note: The last tee you select becomes the default tee for the next score you add. Men and women have different default tees. Type the date or accept the default (today's date) and press Enter. Press C or click the [^] button to view the calendar. Note: HS always sorts scores by date (newest to oldest, most recent first). If you enter several scores for a golfer with the same date, HS will maintain the order depending upon the order in which the scores are entered. If scores have the same date, the last score entered is considered the newest score. This concept can save considerable time when entering batches of scores. For example, assume you have a golfer with 20 scores to enter. Instead of entering a date for each score, just enter the scores oldest to newest with the same date. The proper order will be maintained. HS uses the most recent scores for handicap calculations. If the score is a tournament score, type / (Slash) key or T while in the Adjusted Gross Score box. You can also drop the score type box and select the appropriate option. Note: USGA handicapping gives special consideration to tournament scores. 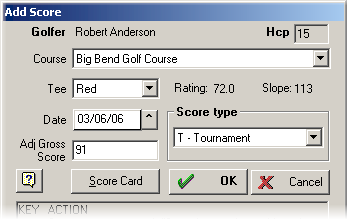 You can also select to use only tournament scores with custom handicapping. Tournament scores have a T posted beside them. The adjusted gross score is not the actual score a golfer shoots, but his\her score after adjustment. The basic reason for adjustments is so that exceptionally bad holes do not disproportionately increase a golfer's handicap. Adjustments are usually made using the USGA \ RCGA Equitable Stroke Control formula. However if you are calculating a custom handicap you can use any type of adjustment procedure, or none at all. + (Plus key) save current score, return to �Adjusted Gross Score� box, ready to add another score. * (Star key) save current score, return to Course box, ready to add another score. - (Minus key) abort score entry and return to the Golfer Table. If you want HS to calculate the adjusted gross score using the USGA or RCGA Equitable Stroke Control press "." (period), "S", or click the [Score Card] button. A score card for the selected course will appear. Note: The score card cannot be accessed if the "..Rating\Slope" course is selected. 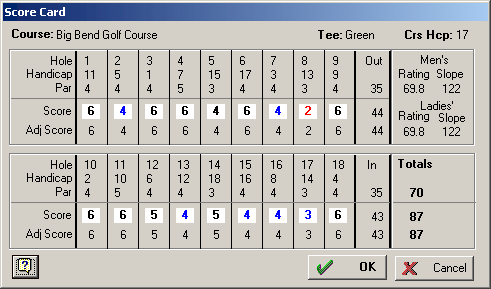 Type the score for each hole. Press Enter or click OK and the Adjusted Gross Score will be calculated.